Spaces are limited – register early to secure a place! Data for Policy is a premier global forum for interdisciplinary and cross-sector discussions around the impact and potential of the digital revolution in the government sector. It is supported by a large number of key stakeholders, including prestigious academic institutions, government departments, international agencies, non-profit institutions, and businesses. The 2019 conference will be held at UCL, which is located in the heart of London. This year we have been overwhelmed by a large volume of quality submissions, representing a diverse range of international organisations and subject matter. We are expecting to host over a hundred presentations over two days of this year’s conference. Please watch this space for further updates on the conference programme and presentations. Important note for presenters: Presenters should register by April 8 latest to secure a time slot in the conference proceedings. Submissions are closed and notifications sent. Data for Policy will hold a one day Specialist/Executive workshops and tutorials pre-conference program. We are therefore inviting proposals for 3-hour workshops on 10th June that preview and complement the conference program. In exceptional cases, allocation of two 3-hour slots (full-day) will also be considered on the same theme. We are hoping for a selection of workshops that will be open to policy practitioners and to researchers, including those with or without programming skills. Proposals from academic, government, and private sectors are welcome. Accepted workshop proposals will be published on the conference websiteand advertised for registration. These participants are key policy makers, public sector, not-for-profit and opinion formers in health, education, transportation or any field where knowledge and expertise will be complemented by a greater understanding of the technical domain, including what is meant by privacy, how to work and communicate with data scientists, use data to improve program delivery, estimate the cost-effectiveness of different digital technologies, and anticipate the regulatory and ethical implications of new technologies. Proposals that target this audience should think of introductory level instruction pertaining to the language, landscape, value, uses and likely impacts of AI, Blockchain, IoT, and Big Data. These participants, from the social or computing sciences or other fields (e.g. law and philosophy), will have some background knowledge and/or training. Proposals that target this audience can make use of this background and present more focused and directed training content on new technologies or data, methods, debates, policy implications, etc. Note that general audience workshops, that both groups can attend, may also be proposed. Workshop/Tutorial instructors will receive an honorarium proportional to the number of attendees to their respective session. Please also note that if instructors are interested in submitting for the full conference program (11-12th June), they will be granted an extension to the submission abstract deadline. Submissions should be made via EasyChair (please see guidelines for further instructions). Data science technologies, pioneered in the private sector, are now ripe for transforming the public sector. However, both government policy and technology providers need to address two pressing public concerns: DIGITAL TRUST (privacy and security) and PERSONAL DATA (ownership and beneficial exploitation). The impact from ‘smartification’ of public infrastructure and services will be far more significant in comparison to any other sector given the government’s function and importance to every individual and institution. Potential applications range from public engagement through natural text and speech Chatbots, to providing decision support for civil servants via AI-based Robo-advisors, to real-time management of the public infrastructure through the Internet of Things and blockchain, to securing public records using distributed ledgers, and, encoding and codifying laws using smart contracts. However, in many cases current uses of automated decision-making systems have been shown to cause adverse impacts on important life events of individuals – examples range from bias in recruitment of job-applicants, to credit scoring in loans and insurance, and to sentencing of criminals. Also, state surveillance and manipulation of voter behaviour have become the early examples of how such developments may amplify the asymmetry of power (between citizen and those utilising such technologies) causing severe damage to the democratic processes. The Bitcoin ‘hype’, with its correlating energy usage, has also shown the environmental cost of the highly complex computations, as well as indicating other potential unpredicted and unintended consequences. On the other hand, the cost of not using – or the slow uptake of – data science technologies in the public sector is also potentially huge, given that all other aspects of our lives are changing fast under the ongoing digital revolution. It then follows that the stakes could be much higher in both the use and the avoidance of these technologies for public decision making and service delivery. This will require a careful cost/benefit analysis before implementation at scale. The fourth conference in the Data for Policy series therefore highlights ‘Digital Trust and Personal Data’ as its main theme. The conference will also welcome contributions in the broader data science for government and policy discussions. In particular, submissions around the value and harm of using data in the public sector, deployment experience in government, ‘digital ethics’ and ‘ethics engineering’ concepts, personal data sharing frameworks and technologies, transparency in machine learning processes, analytics at source, and secure data transaction methodologies are encouraged. Data, Government and Policy: Digital era governance and democracy, data and politics, asymmetry of power, data- and evidence-driven public service delivery, algorithmic government and regulation, open-source and open-data movements, multinational companies and privatization of public services, sharing economy and peer-to-peer services, online communities, crowdsourcing, citizen science, public opinion, data literacy, policy laboratories, case studies and best practices. Technologies: Artificial Intelligence, Big Data, blockchain distributed ledger and smart contract technologies, behavioural and predictive analytics, the Internet of Things, platforms, Global Positioning Systems (GPS), biometric identifiers, augmented and virtual reality, robotics, and other relevant technologies. Systems & Infrastructure: Data collection, capture, storage, processing and visualisation technologies; platforms and web services, mobile applications, meta-data, standards and interoperability, databases and data warehousing, high performance computing, algorithms, programming, decision support systems, user-interaction technologies, and other relevant topics. Data Processing & Knowledge Generation:Data representation and pre-processing, integration, real-time and historical data analysis, mathematical and statistical models, ‘data-driven’ analysis, human-in-the-loop (HITL); mixed methodologies, secondary data analysis, web mining; Randomised Controlled Trials (RCTs), gaps in theory and practice, other relevant topics. Policy for Data & Management: Data governance and regulatory frameworks; General Data Protection Regulation (GDPR); data collection, storage, curation and access; data security, ownership, linkage; data provenance and expiration; private/public sector/non-profit collaboration and partnership;capacity-building and knowledge sharing within government; institutional forms and regulatory tools for data governance. Privacy, Security, Ethics & Law: Ethical concerns around data, algorithms, and interactions (both human-machine and machine-machine interactions) and associated technology responses; legal status of digital systems; bias, transparency and accountability of digital systems; public rights, free speech, dialogue and trust. Extended abstract submissions should be made via EasyChair (please see guidelines for further instructions). After the selection process, submissions accepted for presentation at the conference will also be invited to submit a Discussion Paper. This will be hosted on the Data for Policy community platform on Zenodo for open access publication under Creative Commons Attribution 4.0. Each contribution uploaded on this platform will be assigned a DOI making them uniquely citable. All Discussion Papers will also be considered for post-conference publication in prestigious peer-reviewed journals. In circumstances where a discussion paper cannot be submitted, we encourage poster or presentation slides to be uploaded on the Zenodo platform for open access prior to the conference. Please note that this is a fee-paying event and all conference participants, including presenters, will be responsible for arranging their own travel and accommodation. We have limited funding to support student participation: those who wish to be considered for these grants should send a CV and cover letter explaining their case to team@dataforpolicy.org. This should be done after completion of abstract submission. * Please also note that if instructors are interested in submitting for the full conference program (11-12th June), they will be granted an extension for the submission abstract deadline. Data for Policy conference series is an independent initiative and fully funded by the income raised through conference registrations and partner/sponsor contributions. 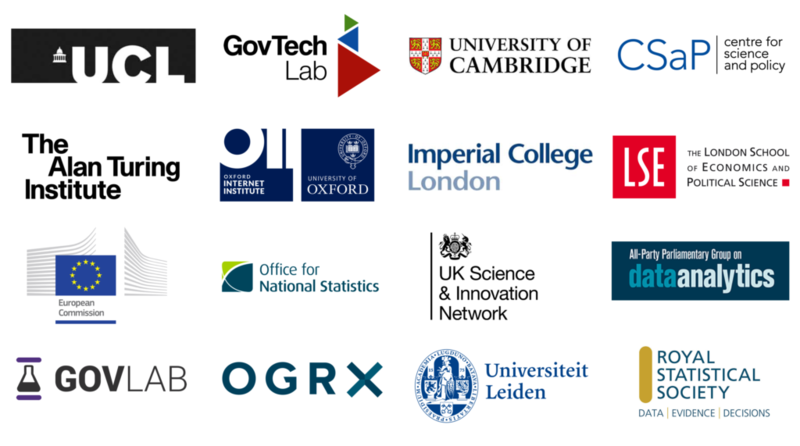 Organisations interested in our flexible partnership/sponsorship packages should get in touch with our team via email (team@dataforpolicy.org). We welcome bids from academic, government and private sector stakeholders to host future Data for Policy conferences. Consortium bids bringing together a host country’s academic and government stakeholders are encouraged and demonstration of further industry support would also be an advantage. Interested organisations should send a brief Statement of Interest to team@dataforpolicy.org, outlining the partnership model proposed and the commitments offered. Bids will be considered on a rolling basis.